Now, I have to say, this commission took a while, for a variety of reasons. For my part, it was mainly financial impoverishment, of which Steve was very understanding. For Steve’s part, it was mostly due to being the Robert DeNiro of Doctor Who costuming, and having commissions literally falling onto the kitchen floor while he did the dishes like in The Meaning Of Life. Probably. But in any case, I sent him my brief, which was, as always, about as specific as Van Halen’s rider. I wanted a certain weight fabric of a certain colour; I wanted lining of a certain colour; I wanted a certain type of button; I wanted four inner pockets; I wanted the two rear buttons to be brought a bee’s armpit closer together; I wanted measurements so precise that I even sent Steve another jacket to meticulously adhere to; I wanted about fifty other nanoscopic details as well; and I wanted a giant martini glass full of blue eminems. 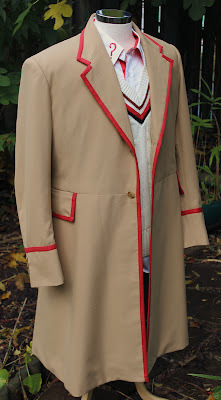 As a client, I may as well have listed my address as Hell (I would ask the reader to bear in mind that Steve specializes in recreating existing costumes as seen on Doctor Who, and probably doesn’t need custom commissions from people who require him to have telepathic capabilities so much). I left a couple of details (the inner arm lining, the pocket welts) up to that shrewd Old Blightyan Steve Ricks, fairly confident that I was in safe hands. So, anyway, to cut a LOTR-length story short, this was ultimately going to be a fortieth birthday present to myself, and the now familiar FedEx box materialised on top of my TV one day while I was at work about a week prior to the momentous and grim day. Steve made sure of this, at not inconsiderable inconvenience to himself, for which I shall always be grateful. As was the plan, it premiered at my birthday celebration itself at Melbourne Aquarium (yes, Aquarium), where I did the Shark Walk (google it). Obviously, the coat was set aside in favour of a wetsuit for the actual dive, but I did flounce and preen and ponce about in it for the rest of the day. Now, onto the coat itself, which is sort of the point of the review, after all. The felt under the collar is a hand-stitched vibrant red, to match the lining. Something of a surprise, but in keeping with it’s predecessor, who had that green chinese silk there. It’s not something anybody would ever see unless you walked around with your collar turned up like Rizzo from Grease (and I’d assume that if you felt inclined to do that, you probably wouldn’t be wearing a frock coat in the first place), but it’s a striking touch. This, combined with the bright red lining, give an otherwise formal and classic design something of a contemporary flavour. 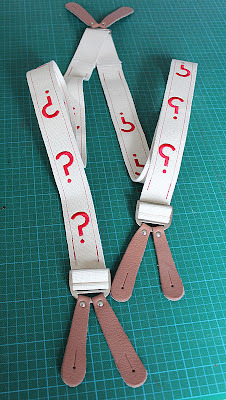 As a further cherry on the cake, the ribbon upon which you would hang the coat on a hook (as if you would ever do that!) is also in this colour, again hand-stitched, as though one final sympathetic kiss from the supermodel you can never have just before she walks away. The lining, as previously mentioned, is a glorious red silk. I asked for red, Steve went out and chose it. The lining is the part that garnered the majority of compliments at my shark-eating ceremony. The inside of the lining mirrors the curved fiddleback seams of the outside, another invisible and traditional detail which only the wearer knows about! 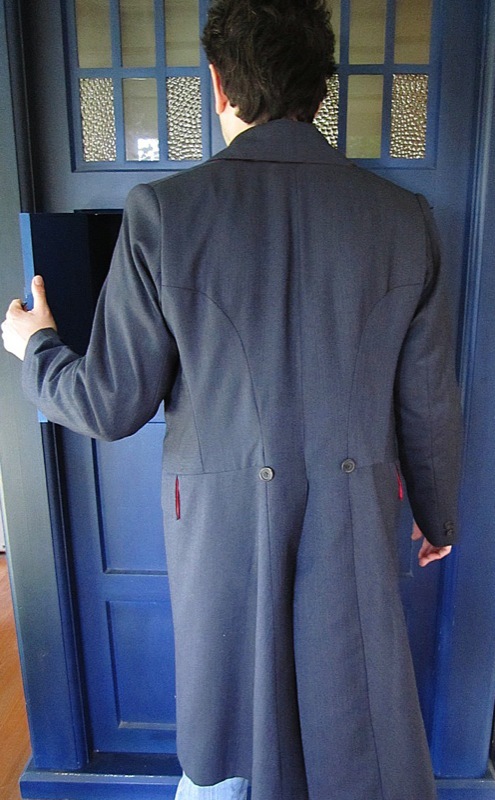 Speaking of frock coats and their curious details which have, for some reason, always been a part of their design, part way down the inside of the coat, just below the pockets, there is a curious stepping out of the lining. 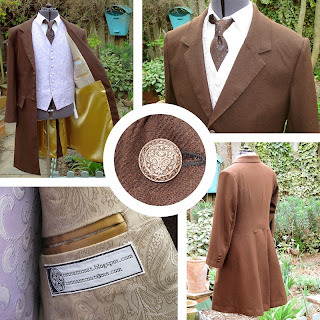 It’s a jarring and unusual feature which you wouldn’t normally expect to see there, but has always been part of a traditional frock coat design. I requested that this little oddity be included, and it has, although Steve has tried to make it as subtle as possible, like a wedding planner who has been asked by the groom for a soccer ball on the cake, and has sought out a vaguely similar 10p-sized decoration to camoflage amongst the icing. 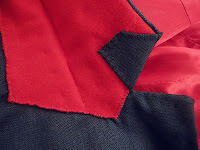 In my brief, the lining inside the sleeves was something I left open-ended (not literally of course, that would have been silly), although I believe I requested that they be something other than the red. And, by jingo, they are. 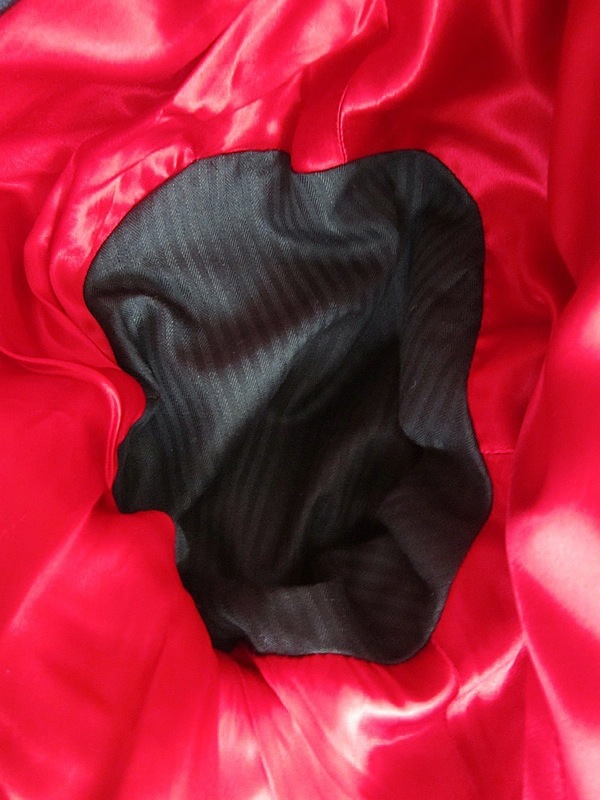 They are lined with a navy blue/black self-striped material, not dissimilar from the elusive Ten Coat lining, although I have yet to discover whether this is what it is or whether it is some other delicacy from the depths of Soho where our meticulous coatmaker sifts for his stuff. Evidently, I’m not allowed to look behind the curtain. And the pockets!! Oh, the pockets ... I especially requested four inner jobs, and in one of my briefs for my brown frock coat I specified that when it comes to the size and depth of the side pockets, a general rule of thumb is that they should comfortably admit an amaray DVD case. Not that I’m a shoplifter or anything, but it had always just seemed useful in the past. For some reason. Anyway, the internal pockets are much wider and more generous that previously, and I believe that it might be entirely possibly squeeze a DVD player into the sides! Not that I plan to, but deep pockets are always useful when visiting planet earth, what with all our gravity and stuff. 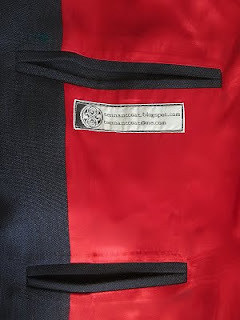 The underside of the pocket flaps are also endowed with the red lining - another hidden touch that makes you feel smug to know that only you know about it. Buttons - well, I just asked for something dark blue and plain there, but, having said that, I still don’t think I’ve seen anything exactly like them round these parts. 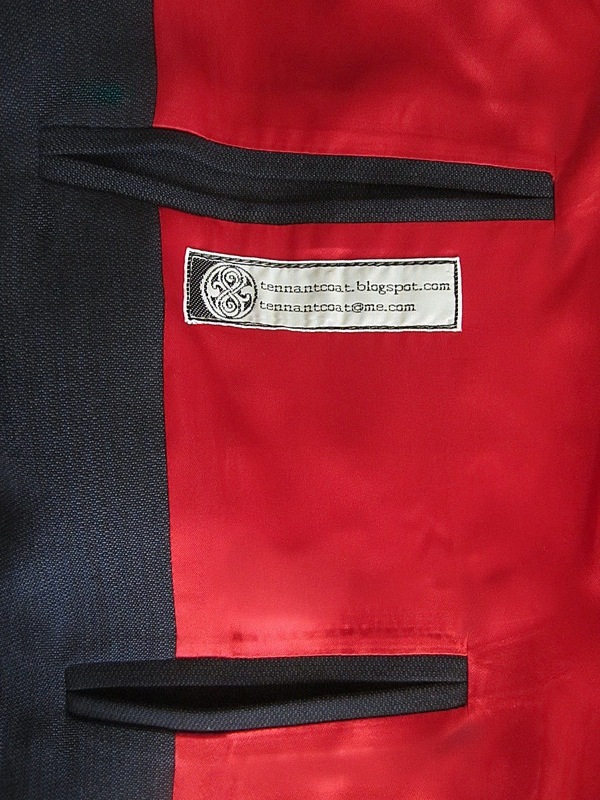 Twin button closure, with the lower sewn right into the middle seam of the coat, as requested, with two (rather than three) on each cuff, and, of course, two on the back vent. I had asked for navy blue in my brief for the outer shell, and this certainly is that, but with the subtlest of lighter blue pinstripes, which are so subtle you can’t even see them under certain lighting conditions. The fabric is of the perfect weight and texture, and the fit is like a glove. Except it’s a coat. So, the bottom line is, my oddessy is over now. It’s done. I mean it this time. 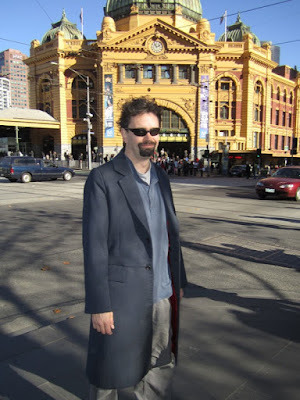 I have found the frock coat I have been looking for since 1984, and this is it. In fact, if any of you attend my funeral in several decades or weeks’ time, and you peer into my coffin, and if you are not too distracted by the lipstick and blue eyeshadow that my mates will have doubtlessly smeared on me as a joke, and the Wild Turkey bottles they’ve squoze into my waxwork hands as though they would be of some use to me, you will see that my mate Colin (the embalmer) has dressed me in this frock coat. That’s right, I’m taking it with me. 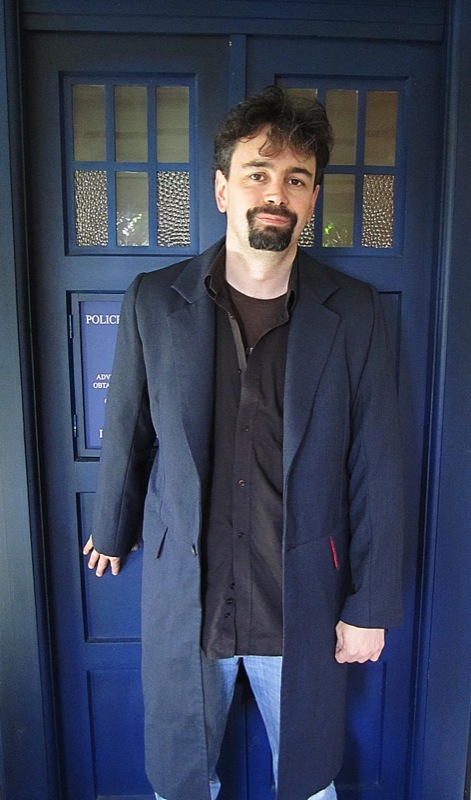 Or maybe I’ll be wearing the Ten Coat Steve made for me. It depends how I feel in the day.